The New York Times loves Cristina! ID Document in Argentina? Only if you’re Illegal. Moving to Cafayate, Salta, in Argentina? What does a CIA agent carry? Hi Druidhouse, thanks for your support. I’m sure there are some, but I don’t know of a single jewelry store that went out of business after the 2001 collapse. Right away all of them set up signs of “I buy gold” and got into the business of precious metals, smelting jewelry gold. There was more than enough people in a fragile financial situation, and many of them ended up selling what gold jewelry they had. If you haven’t gotten into this I, suggest you do. It’s one of the most lucrative sides of such business during a financial crisis and I know that this is also happening in USA. It may not be the line of work you are used to, but you have to understand that adaptation is key during times like these. There’s people that because of the crisis started new business they knew nothing about. In your case it shouldn’t be that great of a jump to start buying junk gold and silver and selling it to a smelter or having it smelt. You could even learn the process yourself if you know enough about it. All I can tell you is that all jewelry stores here have a big “I buy gold” signs and none of them has gone out of business. Besides this, you should start looking into new strategies for your business. Before you even get started know that yours isn’t a bad situation. If you find the right angle I know you can make it work. My brother in law’s uncle, he started making silver jewelry in his 40’s not knowing the first thing about any of this. As I mentioned before, the price of gold made silver jewelry more attractive and he started selling to a handful of store and he’s still doing ok.
Maybe the stores you were dealing with haven’t adapted, how about looking for new ones? How about starting your own online store selling silver jewelry? Invest in a good website designer. Evaluate the jewelry designs, are they trendy? Are they appealing to what people like these days? Do a bit of research and see what’s selling well. There’s a market for steel jewelry as well. I suppose these are mostly resellers but people do buy them. Again, I’d study your business, evaluate your marketing strategy and try offering new models and find new dealers. About your PM, yes of course, prices will keep going up and when there’s shocks in the economy like the US rating, expect a jump in the price. Bribing is almost a cultural thing in South America, of course I don’t encourage any sort of illegal activity in first world country like USA. In South America? Sometimes you don’t have a choice. In case you ever travel down here and get into trouble, just for the record and since you asked, officials favor cash. Barter did work for some time, but it was the last, desperate resort and everyone involved in it would have preferred cash. When there was no money, it was better than nothing, that why we had barter clubs after 2001. I’m not saying its not an option, it may as well be for some time, but you’ll want better means of doing business than bartering. Don’t lose faith in your business. Change your strategy and find a way to make it work. It is possible and people have done it before here. Trendy fashionable designs, (study what people want), affordable prices, you seem to be aiming already at the $20-$50 gap and explore new marketing alternatives and dealers. I hope this gives you a few ideas of how to make it work. It is said that the worst thing that can happen to a man is to outlive his children. Having kids of my own I have little doubt that this is true, but an even worse outcome would be to have your children simply missing forever. What fate did they meet? Are they ok or have they suffered a horrible end? Not knowing and simply being left to fear the worst forever can be worse than simply losing them. As I write this there´s yet another child missing in Buenos Aires. Eleven year old Candela was last seen waiting at a friend”s house just a block away from here home. Its been almost a week now and there´s no news. Usually after the first 48hs, if the child wasn’t found the chances of finding him alive go down considerably. If you´re wondering whats this got to do with an economic collapse or crisis, you should know that these things only get worse during economic down turns. With the degradation of society in general comes along more perversion, more organized criminal activity combined with a tighter budget that has an impact on the police capabilities, both in terms of prevention and investigation. You may think that perverts only kidnap kids from careless parents, or that kidnapers only go after kids with money. Studying these events you see that kids can be kidnaped during a distraction that lasts seconds, and that often your financial status has little implication: The child itself is the motivator. Even if they are looking for ransom, one of the changes seen after the economic crisis is that anyone can be a victim of this sort of crime. A business that went well, a car that got sold, even if your financial situation isn’t that good any child can get kidnaped and a couple thousand bucks asked for his safe return. Anyone will find the way get hold of a couple thousand through friends or relatives if your child’s life is at stake, you don’t need to have money, they are counting on that. As the economy gets worse and more people become desperate, as the society continues to degrade, we will continue to see even more child abduction in the US and world wide. The situation in US regarding the amount of children that go missing each day is already alarming. Sexual Exploitation: This is one of the most common causes in Argentina. After the 2001 collapse it became more and more common for children to get abducted so as to be exploited in one of the countless brothels along the country. With the social degradation that follows an economic collapse comes depravation of many kinds. The network and connections with both local police and political power makes it extremely hard to rescue children or adults from these organizations and they usually move them often from one brothel to another across different provinces to make identification harder. It not only happens with children. 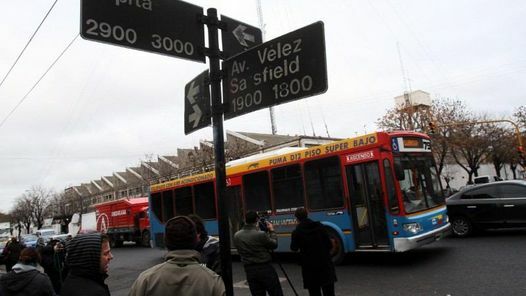 These groups have been known to abduct women in their 20´s and 30´s on broad daylight right from the sidewalk. Kept drugged, threatened, locked and incommunicated its very hard for them to contact the outside world. Sexual Abuse/Murder: Perverts of all sorts abound, and it only gets worse when they feel the police can’t stop them and when police fail to properly investigate the cases. Organs: Some organizations especially go after the body organs. This is unfortunately common in Latin America because of the high price organs go for in the international black market. National/International adoption: Also very common, these groups abduct babies, children, even pregnant women to sell their children abroad. In many cases the parent dont know (or dont want to know) where the child comes from. ID and adoption forms are readily provided by people that work in adoption agencies and are in it. Ransom: This type also boomed after the 2001 collapse. Kids are small and easy to abduct, and parents will do anything for their safe return. In some cases the more expensive schools allowed their pupils to go without their uniforms: The children were specifically being targeted because of wearing it, a clear sign that their parents had enough ransom money. A second of distraction is all they need. maybe your son asked to go to the bathroom, take a look at some nearby store, walk to a friend’s house across the street and you thought it was close enough, that it would only take a second. That’s all they need. One child that went missing in a mall in Buenos Aires was fortunately rescued. The mother immediately noticed he had been taken and alerted security. Having had children abducted in it before and being ready, they immediately closed all doors. The child was found moments later in a bathroom, drugged, his clothes already changed, his hair cut and dyed. Talk with your children and make sure they understand they should put up a fight, most of all SCREAM for help when grabbed by a stranger, clearly shouting that the person is a stranger. While people dont help adults as often, in average people will help a child that they feel is being abducted. Finally, always keep an eye on your children. The second he is out of your sight anything can happen, and once you lose them its too late. Pay especial attention in parking lots, supermarkets, parks and theme parks, airports and other places where theres either conglomeration of people or easy exit routes for them to escape. This happened in Buenos Aires close to where I live a couple weeks ago. At 4 AM a group of five armed criminals enter a bus and proceed to rob the passengers. As two of them approach the metropolitan police officer in the back seat, he draws his issued Beretta Px4 Storm, identifies himself and orders them to stop. The bad guys bring their guns up, he shoots and kills the closest two, two shots each (“but…but… 9mm is a poor stopper FerFAL, you need to shot bad guys at least seven times with it according to what I read on the internet! !”) The other three ran to the front, screamed to the bus driver to open the door. Fortunately he complied and the remaining criminals ran away. Now if you listen to what people have to say, several will tell you that a 5 vs. 1 armed confrontation is hopeless, especially when its inside a bus with at least ten innocent passengers! This is yet another example that shows how the right mindset, combined with the intelligence to take advantage of a tactical opportunity during a moment of distraction, having the right training and weapon to level the odds, even during seemingly hopeless situations like this one there’s still hope. The police officer knew that if he was identified as a cop he would have been shot immediately as it so often happens. He knew he had to respond aggressively and having innocent people to consider and no possible cover, his retaliation had to be decisive, his only cover being a steady and accurate delivery of lead. During another incident where two off-duty metropolitan police officers where involved, a vehicle intercepts the car where the officers are traveling, and criminals pull guns on them. They shoot them down, both the bad guys that get out of the vehicle and the ones that were pulling guns through the windows from the inside, killing everyone except for the driver. Both of them had been trained not to shoot if they could clearly see both hands and confirm that there was no weapon. When the shooting started the driver stood still, tightly gripping the steering wheel. When the shooting ended the driver was still frozen in place, still gripping the steering wheel, both hands visible: Turns out he was a hostage, the owner of the car and had been picked up as a driver for their crime spree that night. While the luck factor is always there, awareness, determination, training and having the right tool for the job makes a huge difference in the outcome of this kind of event. If you’ve been following my blog for some time now there’s a good chance you have some of the essential preparations covered. Accepting the possibility of a tougher, more complicated future, understanding that survival and preparedness is more of a way of life, getting ready to handle problems. While mindset and the lifestyle adjustments are a long process, preparedness starts with it none the less. You probably got a good share of your gear and supplies together already, or at least have the essentials and understand the importance of food, water, emergency gear, some savings and so on, but what comes after that? If you find yourself in this situation, read on and see where you can pick up. Guy, one of our readers, he sent me this link regarding what kills you after SHTF http://members.beforeitsnews.com/story/1000/685/NL/The_4_Most_Likely_Ways_You_Can_Die_If_the_SHTF.html . The article isn’t bad and reminds me of one I wrote called “What Kills you After an Economic Collapse”, but it is missing the number one cause of death after SHTF: Stress. Stress causing depressions and suicide, stress causing cardiac problems, decreasing your immune system, stress causing eating disorders and the health problems that come along with obesity. If you already bought the cool survival stuff, a Glock, stocked up your pantry and saved a few bucks in the piggy bank and you ask yourself what’s next, take a good look in the mirror. Be honest with yourself. More than likely you can be in better shape, have better cardio resistance or become stronger. Once you accept that you can do better, then comes the part of deciding what to do. Golf? Tennis? If you acquired the survival mindset you don’t make these decisions lightly. Your choice will seek the greater benefit for a number of possible scenarios, so you probably would look approvingly of ways of working out that also make you stronger for fighting, working and running. For a combative oriented workout I recommend “Combat Fit” by Cliff Wiese. Cliff made these DVD with Gabe Suarez, and the workout in it isn’t your Jane Fonda type of thing, but clearly oriented to becoming stronger for fighting, concentrating on upper body strength. Overall its very good workout for the entire body and I included it in my routine. Add to it some walking, running or stationary bike and if you keep a reasonably balanced diet you should feel better and stronger fast. When it comes to relaxing the mind it gets more philosophical. For some of us, our family is our emotional safety net, while for others its all about going camping and being alone in the nature a few days a month. Hobbies that can be practiced with certain frequency help you to stay sane. I enjoy shooting and defensive training so that’s how I unwind. Camping is great as well even though I haven’t gone camping in ages but plan to do it once we relocate to a safer/better place. While a lot of S&Pers own firearms, the number of people that actually get professional defensive shooting training is limited. Of those, the amount that get more than one basic class is even less, and even fewer people get a couple classes every year. The files become pitifully thin when you then pick how many train this on weekly basis. I’m not being mean, just honest, and I know how hard it is to find the time and the right group so as to be consistent. First aid, trauma and gun shot treatment should be part of your curriculum as well. Most serious shooters that I know of would know what to do if they get shot (even accidentally during training!) and many keep the essential supplies for such an event in their range bag. Other skills such as first aid, bushcraft, carpentry, mechanic, gardening, to name a few, these both have a practical S&P side and can become cherished hobbies or family activities. Remember the part about being consistent with defensive training? It seemed impossible to me some time ago but that changed when I made like-minded friends. There’s not many, and they are especially hard to find in South America, but they are out there. It should be much easier in pro-gun USA. Don’t give up, keep looking and be friendly. Eventually you’ll either find one or form such a group yourself. Start by getting training and meeting as much people as you can, hopefully finding folks that live near by. Join the Modern Survival forum and see if anyone lives near by. That’s when training weekly becomes easier. Having friends and buddies has several advantages as well. I don’t know about you but sometimes I don’t get along that well with people that are still blindfolded to the reality around them. I can interact with them but its not my favorite type of person and I’d rather be with people and friends that see things as I do. Before you realize it you find yourself surrounded by people like you. Your kid’s birthday, Sunday BBQ, its you and your friends, everyone packs and has trained together numerous times. If something bad happens you cant ask for better company, right? The friends and “buddies” you make are one of your greatest assets during troubled times. People to do business with, to be friends with, train, doctors that give personal advice, cops that help you out with security problems, someone in the municipal building that can help you with bureaucracy stuff, the network of people you know is of great importance. With high unemployment (20-25%) such a network is the only way to find a job. Some may be friends, others are simply acquaintances, but its important to establish that “buddy” relationship of you scratch my back I scratch yours, you do this favor for me and I’ll do one for you when you need it. By now its clear that the next step is mostly about taking S&P seriously. This also means enjoying it, because if you don’t you simply wont do it. You CANT do it as an obligation, you must find aspects of it that you find fulfilling at a personal level. Soon enough your hobbies, your life decisions in general and your friends, its all influenced in some way by your survival and preparedness mindset. When people email me about getting the husband and wife or the kids involved, this is what I mean. Your family must accept and participate in your preparedness, even within more limited roles, they must accept it an embrace it. It can’t be simply an annoying hobby that the wife puts up with. The entire family must understand its seriousness even if you cant expect them to be as involved in it and as excited about it as you may be. Its not necessary for your wife to become GI Jane, but she must understand the seriousness of preparing. Your essential survival “group” is your family, and your group will only be a strong as its weakest link. In the good old days you could just lean back after retirement and enjoy the golden years. Buy a camper and visit the kids and grandkids across America. This may not be the case anymore for a lot of people. A fixed income is a limited time option when inflation eats up the purchasing power of what you get each passing month. Having investments, property to rent (and rent to increase along with inflation) or some side job to help compensate will become important for you when you finally retire. The type of investments you make, or how you go about generating extra income can be most variable. The point to be understood is that a fixed retirement income simply may not be enough, that you need investments that generate income, and that you may contemplate the possibility of having to keep some sort of income generating business, self employed or part time work within your capabilities. Its very likely that more than retired you have to think about it as being semi-retired instead. Even more of a reason to find something that you enjoy doing so as to gladly keep doing it after you officially retire. Thank you very much for your reply & suggestion! I thought of the same. Thanks for reaffirming it in my mind. One thing you didn’t have chance to talk about in this post or any other (I searched through your blog extensively) is the definition of a “gated community”. Was it that the residents on a given street decided to organize and hire guards or were there special communities built with gates all around and a guard at the front? I guess both. Any lengthy discussion on how and where people prefer to live in Argentina today would be helpful. Again, I appreciate your reply very much. Thanks for your time and god bless you for your hard, but very helpful posts. Alex, that’s correct you have mostly two kinds of guarded communities. First you have ordinary blocks where people get together and hire private security. This is often a post on street corners covering a neighborhood or part of it. What you get is what you pay in this case. It may be as little as paying an of duty cop trying to do some extra, to a private firm that both has posts on each corner and patrolling vehicles. This is common in most middle/upper middle class neighborhoods in Argentina. Then you have gated communities that were specifically built that way. These too can be of the lower end type or better ones. The good ones will usually have a monitored double chain link fence perimeter, guards and patrols both along the perimeter and inside the community. The cheaper ones have poor security, lacking proper training, equipment and not enough man power. Its common to hear of robberies if the security isn’t up to the ever growing challenge set by criminals. This final alternative, the community with good security, would be the best compromise when crime becomes a serious problem. Neighbors organizing on their own will never achieve a steady level of security in the medium or long run, everyone has other things to do eventually, job, family, it never lasts long when neighbors try to guard the area on their own. Hired security has proven to be more effective. First of all, thank you very much for your book and the survival forum. I am learning so much there, my head spins. There is so much to do. I hope I will make it on time before SHTF. Now, to my question that I hope you will have time to respond to. I can’t make up my mind and it is driving me crazy. We are planning to buy a place in a small town close to my work. However, I can’t decide whether I should by a townhouse or a stand alone house – from the security point of view. Normally, I would buy a house. However, after reading about how people live in Argentina (gated communities) it feels much “safer” to buy a townhouse. Even though I probably won’t be able to change the doors and windows there, at least I will have neighbors around me (who could call 911) and I expect robbers to prefer stand alone houses (no others around) to townhouses. What is your take on the situation? I would appreciate any thoughts you have. Hi Alex, thanks for your email and I’m glad you’re liking the forum. Its getting more people every day and its getting pretty good. From the security point of view the townhouse is safer. The security issue is pretty complex but that’s the short answer. Are you more likely to get your bike or football stolen if left on the front lawn? Yes. But is your isolated house more likely to get broken into and picked clean when you take a weekend off and leave the house empty for a couple days? Yes. I don’t like having people near by but I now know that not having neighbors in sight also means there wont be eyes watching while the bad guys break into your place. That’s what every criminal wants. There’s no guarantees though. With bad enough crime, you can suffer home invasions in the townhouse or detached house just as well. There’s also other factors to keep in mind. Some people (me included) like having their privacy. Attached houses means you shore a bit too much with your neighbor. The balance for me would be a community in the suburbs or near by small town or subdivision with detached houses. Close enough so as to have help, but still enough distance so as to have enough privacy. At least for me it comes down to balancing with the different pros and cons. Security, privacy, distance from schools, work, stores, and can I reach them if the price of gas doubles next year? Walking distance is great, availability of public transportation would be preferred, or at the very least know I don’t have to drive 50km back and forth. If the security problem isn’t very bad in the area you’re looking ( its probably not) I would look for a detached house, but one that has at least a couple neighbors within site. the high rate of muggings. As the precious metal has nearly doubled in value from two years ago, gold merchants have boosted security amid a series of brazen store robberies. Police are urging owners of gold jewelry to be discreet about wearing it. Remember what I wrote a few years ago about women here no longer bothering buying gold jewelry, even small pendants, rings and chains because they can’t wear them anyway, because criminals especially target them? Remember that article I wrote about robbing a jewelry store in Buenos Aires being more profitable in average than robbing a bank? This is also happening in some parts of USA as well. If its not happening in your area (yet) it may still be a problem sooner rather than later given current world events. Ten years ago I told people about the “I buy gold” places that sprouted all over the country overnight after the collapse. This too has become a common sight in many US cities. We’re past police warning people about wearing gold jewelry as the article says, but more similarities and parallelisms keep coming up, things you only used to see in 3rd world countries. Some people that consider themselves survivalists, they believed they would never live to see this sort of thing happen in USA, that the country would collapse entirely before this sort of thing occurred, people going up in arms and taking the country back from the tyrants. But it didn’t happen that way. It’s still the same country folks, only a bit worse than it used to be, and the slow sliding towards worse standards of living, more poverty and social degradation continues. The obvious advice here is to be careful about wearing gold jewelry, especially in populated areas where they can be easily robbed off your neck by snatching it and running (hurting you in the process, happens a lot) . On the good side, there’s something we’ve seen here and is a new market for silver jewelry. Even women that could afford gold jewelry ended up buying silver designs instead because of the risk involved. Why buy something you can’t wear? A handful of business did well for themselves by offering trendy and appealing designs in silver. Not only were they fashionable and more affordable, you could also wear them for a change. Just another possible business idea to consider. The reason I’m writing this is just to convey a personal financial SHTF situation that happened to us, and describe how my “preps” beforehand helped me sail through the experience with minimal impact. Just to be clear, this isn’t an exciting shoot-the-looters story, it’s just a tale of how the “boring” aspect of preparation are still important to ensuring stability. My background: I’m a businessman. I earned my undergraduate degree and then an MBA, and have worked since then in professional services. In my spare time I’m also a gun nut with over 300 hours of tactical / self defense firearms and other fighting training, and am a serious shooting competitor. I suppose I became a “prepper” when I was a kid living in Miami and watched the riots in Liberty City (1980) and Overtown (1982) unfold on TV. I vowed even then that for the rest of my life I’d be ready for any type of calamity. But I didn’t get serious about it until 9/11 which left me stuck on the other side of the country from my wife. After 9/11 I’d often visit “survivalist” forums (you know the ones). Although full of a lot of hot air, the forums did provide me with some useful things such as the idea of building a priority grid: the matrix where you sort out the most high-likelihood, high-impact events and prepare for those first. During my long flights I would work on the grid and eventually saw that my #1 priority was to prepare for a recession / layoff. Dang, and I had wanted so much to prep for an EMP strike. Oh well. But how to prepare? I’d weathered several recessions before, and had never been laid off in my life, so I had to think a lot about what it would mean, what the impacts would be to my life. And, how could I mitigate those impacts? I put together two lists to deal with this potentiality: stuff to buy and stuff to do. o Pay off all debt and save up cash for 6 months of expenses. o Write down on paper what an “emergency budget” would be. It stripped out all nonessentials like lawn service, cable TV, restaurants, movies in theaters ,etc. And I was sure to go through it with Mrs Stryder to make sure we both knew what to expect and agreed to it BEFORE anything happened. o Always be doing a job search. Reach out to networks, contacts, former clients, etc. o Food storage, starting off with 30 days, built out gradually. I got to 120 days. I’d LOVE to have a year’s supply… still working on that. o Energy production: my idea was to get small scale solar panels to reduce electricity costs during a layoff …. Never got around to doing this, the cost:benefit ratio was too high. o Security: guns were already taken care of, as I suspect they are in any self-respecting “prepper’s” home. I took over 300 hours of self defense / tactical firearms training as well, in addition to edged weapon and mixed martial arts fighting. Also hardened home with better locks, security system etc. Fast forward to 2008. There were strong indicators in the Fall that my firm was headed for bankruptcy, and we employees knew it. So, I started to both “up my preps” as well as seriously look for a job. My company was laying off in droves and within six months, 75% of the company had been let go. I was still there in Summer of 2009, one of the last people left in the firm. I tell you it’s an odd feeling to be the one to turn out the lights in a corp. you helped build. I started job searching in the Spring 2009, and had my first interviews before my official final day, which enabled me to credibly say in my first interviews that I was still employed. This was key as it was 2009 and it was the worst job market in almost 10 years, in a state (Oregon) with the 2nd highest unemployment rate in the country…. Not a good situation so I had to maximize every point of leverage I had. When I got “the call,” I was 100% mentally ready and prepared for it due to all my “preps.” I can’t say it felt good to be let go from a place I worked hard to create value in, but I had faced reality long before, so that when the time came it just felt like an emotionless business transaction. From that point onward I put my job search into high gear, and put the whole emergency budget into effect. Fortunately my company gave me two month’s severance pay as well as all my unused PTO (six weeks! I told you I worked hard there…) so I made it my goal to not tap into my emergency fund. It became like a game for us: I took on the grocery shopping duties, always looking for the best deals, and we had weekly challenges to see how little gas we could use. I’d ride my bike to the store when possible and Mrs Stryder took the bus to work. We’d also shop at “that store” in “that part of town” where “those people” normally shop. Former colleagues of mine – who were themselves out of work – in contrast shopped at Whole Foods. I showed them how much cheaper it was to shop elsewhere but they still managed to rationalize spending 50%-100% more on groceries just because they like the decor. Whatever. Each day I just kept myself busy, with a schedule. I devoted 4-5 hours of focused time to the job search and the rest of the time was spent on other worthwhile activities like shopping, tending the garden, home repairs, reaching out to friends & family, etc. Having productive activities each day enabled me to keep from feeling down and playing the useless “what-if” mental game. Within two weeks of my last day, I had my first job offer. It wasn’t a place I really wanted to work in, so I held off committing to see if I would get any other offers. I had this leverage since I knew that I could survive / get by for 9-12 month before NEEDING a job. So I waited, and within three more weeks, I had two more job offers in hand that paid more, and better suited to me. It felt good to not have to take a job I didn’t want just because I needed a paycheck. When I drove to my first day of work at my new job, I thought, “wow, my plan really worked!” OK sure I wasn’t in a life or death LA Riots type situation but … damnit we it was a real SHTF event for us, and we got through it with minimal impact, due in no small part to the preparations we had made. When I first got out of B-school in ‘99, my mindset was way wrong, having bought into the image that “I have an advanced degree from a top school and work at a top firm. Therefore I must live in a ritzy neighborhood, drive a new car and belong to the country club, and golf every weekend.” I realized after some years that that just wasn’t me, and it didn’t jibe with my desire as a prepper to be secure & safe, and so I changed my mindset. I switched from being a conspicuous consumer to being a saver, and focused on “reducing fixed costs” in accounting-speak. My work colleagues couldn’t & still can’t understand why I drive a 10 year old car, and live in a more affordable neighborhood away from the city. Whenever they ask, I answer honestly, “because it’s cheaper.” And that answer is almost always met with stunned silence, or some rationalization of why spending more money on a newer car or being closer to the city helps me enjoy living now. Ummm, I kind of enjoy my life actually! So, Mrs. Stryder and I have long been focused on saving money and realized the goodies we normally enjoyed (such as maid service, cable TV, etc) could go away at the drop of the hat. And because I had socked away a good amount of $$, and because I was on top of things, the impact to our lives was minimal. Despite all that was going on: unemployed for the first time ever, terrible national economy, worse local economy, stock market crash, bank nationalizations, TARP, QE 1 & 2, etc., I slept well every night because I knew we’d be OK. And that last sentence is to me what the value of being prepared was. Mindset really is key. But what specifically did that mean for us in this case? It meant we simply had it in our minds that we would NOT be put down by this layoff. We knew who we were, and that this bizarre set of circumstances was just a bump in the road of life. Having the right Mindset helps you adopt a frame of mind that you keep with you daily. You thus train your mind to see opportunities and possibilities – and take advantage of them – when you otherwise may not have. Honestly, I don’t know what else I could have done. I guess the only other thing I might have done in hindsight was to not be part of the big Obama Gun Buy of 2008. I spent a lot of $$$ on that. But on the other hand, I wound up getting all the things I had planned to anyway for “preps,” just earlier than I had planned. · Financial: Millionaire Next Door, Dave Ramsey radio show. Rich Dad Poor Dad was OK but you can sum up the entire book in about a paragraph. · Real world survival in an economic decline: FerFAL of course! · Gardening: Square Foot Gardening, Jack Spirko’s podcast. I have a small collection of bayonets and some of them would be good general purpose knives. The Spanish bayonet you mention should serve you very well. They are not made of the latest high tech super steel but then again they are usually tougher and less brittle than the “survival” knives you sometimes find. Some people think that the harder the better and that a 55Rc hardness like the one you may find in a bayonet is too soft. 60Rc may sound good on paper but more is not always better. First it’s harder to sharpen, something that you eventually have to do with any edged tool. Second, you also lose in terms of brittleness, and such a hard blade may snap if its too hard and the tempering wasn’t perfect. Bayonets on the other hand, they are purposefully made for fighting, sticking it into an enemy and applying torsion without breaking. What you lose in terms of edge retention you more than gain it in terms of how much you can abuse the blade. By all means, if you like bayonets or you happen to enjoy this one you have, there’s nothing wrong with it and I’m sure it will serve you well. For prying, abusing, striking like a hammer, its hard to find a tougher tool. In the age of gunpowder the humble knife is often underestimated as a weapon. Phrases like “don’t bring a knife to a gunfight” often reinforce these erroneous concepts. The funny thing is, it’s the same people that also know most gunfights occur at 7 yards or less distance. Close in a couple more yards and you’re getting into ranges where a knife used by someone that knows a thing or two about them can literately create a bloody mess. Knives are plentiful, a large chef knife that can be used as an incredibly efficient weapon can be found in any home. 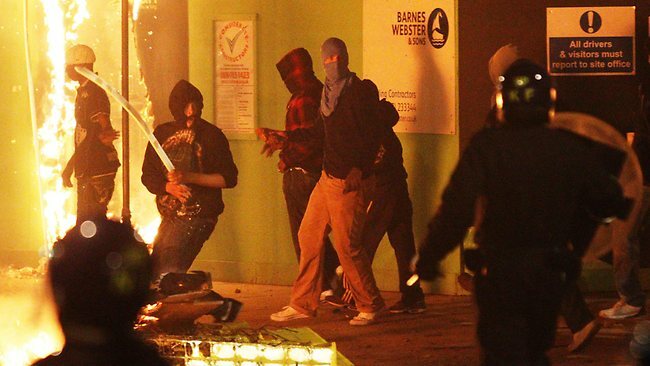 During the riots it is said that baseball bats sold out in London. I would have gone to a supermarket and bought the largest chef knife I could find instead. When I wrote my book, “The Modern Survival Manual: Surviving the Economic Collapse” the section on knife fighting was considered excessive by a couple readers. There was a reason for that. I can write quite a bit about guns, and I did, but knives is what every person has near by at any time in their home, what a person that hasn’t gone through defensive training and never bought a gun will still manage to get hold on, and what people in countries were guns are heavily restricted or banned can still use for defense. It’s as if its embedded in our DNA, maybe it is after thousands of years of having used one as a weapon or tool. It is because of this that I went into such detail explaining the best way to use the most common blades available to people. Since the bayonet is designed for combat it’s no surprise that it will excel as a weapon. Though many old bayonets where strictly for stabbing and therefore were not sharpened, modern bayonet-knives are also intended as utility knives and do have respectable sharpness. Steel used in bayonets isn’t fancy and wont hold and edge like some of the better modern steels, but they compensate by being easy to sharpen and resistant to abuse that would easily break a knife made of “better” steel. A bayonet like the one you mention would be perfect for defensive purposes. The penetrating tip is designed just for that and properly sharpened it will hack and slash nicely too. The currently issued M9 Bayonet would be a good choice as well. Its not a bayonet but still worthy of recommendation, anyone looking for a fighting/utility knife will be more than well served by the time-proven KA-BAR USMC Fighting Utility Knife. Thanks Rick, that’s a pretty nice article on situational awareness. Last week’s Security Weekly discussed the important role that grassroots defenders practicing situational awareness play in defending against terrorist attacks by individuals and small cells, what we refer to as grassroots militants. Anyone who reads STRATFOR’s security and terrorism material for any length of time will notice that we frequently mention the importance of situational awareness. The reason we do so, quite simply, is that it works. Situational awareness is effective in allowing people to see potential threats before — and as — they develop. This allows potential victims to take proactive measures to avoid a perceived threat, and it enables them or other observers to alert authorities. While threats can emanate from a number of very different sources, it is important to recognize that terrorist attacks — and other criminal acts, for that matter — do not materialize out of thin air. In fact, quite the opposite is true. Terrorists and other criminals follow a process when planning their actions, and this process has several distinct steps. The process has traditionally been referred to as the “terrorist attack cycle,” but if you look at the issue thoughtfully, it becomes apparent that the same steps apply to nearly all crimes. Of course, the steps in a complex crime like a kidnapping or car bombing are far more involved than the steps in a simple crime such as purse-snatching or shoplifting, where the steps can be completed quite rapidly. Nevertheless, the same general steps are usually followed. People planning attacks are vulnerable to detection during various phases of this process, and observant people can often spot such attacks developing. Therefore, situational awareness serves as one of the key building blocks of effective personal security, and when practiced collectively, national security. Since situational awareness is so important, we thought it would be helpful to once again discuss the subject in detail and provide a guide that can help describe what situational awareness is and explain how it can be practiced at a relaxed, sustainable level. In the good old days it came down to buying fake Rolex watches or purses from a street vendor in NY, but since the world is “moving on” you will eventually find that counterfeits are more common than before and if you are not used to detecting them you may get fooled. From clothing to paper money, coins, barter coupons (most are very easy to make), medications, electronics, precious metals, food and drugs, every item you can think of may have a counterfeit counterpart out there. In Argentina most people are used to telling the difference and will rarely pay retail for something they know isn’t original. Places like La Salada market sell fake jeans and brand name clothing and people pay accordingly. The problem comes when you get tricked and pay full price for something that isn’t worth it. This can also happen when buying electronics, even worse, it happens with food and drugs too. Getting food poisoned because you bought a product that you thought was a quality product but was in fact an imitation with no quality control can get you sick or killed. You thought this wasn’t about survival? People have died because of poisoning by fake makeup here, and there’s still an on going scandal due to deaths caused by fake medications provided by Unions in Argentina. The government was providing through Unions placebo medications for among others, cancer patients. They stole the money instead of buying the actual drug, and the fake medication wasn’t even the drug the patients needed so they died. How’s that for taking these things seriously? 1) Know the product. You should be fairly familiar with it, do some research on line before buying, check for videos and detailed images of it. Especially with medications, if you feel the product isn’t original you can call the company and they can help you verify its authenticity. 2)Know its price. Is the price is too good to be true? Then its probably not true. 3)Look for details. Once you know the product, verify the small details such as tags, print quality, colors, materials used, markings, these are the best way to detect a fake brand product. Sometimes they erase the expiration date with alcohol and put new ones in expired products. If the expiration date isn’t cut or engraved into the product’s packaging and simply written or printed with ink, be suspicious. 4)The overall feel. This is easier to tell if you have handled an original version before for comparison. The fake product just feels… fake. You cant put your finger on it, but you can tell the general quality and finish is poor. 5)Who are you buying from? If the dealer isn’t official, if he’s not operating from a brick and mortar building or hasn’t got good online reputation then you know the chances of getting a counterfeit product increase. BUENOS AIRES — President Cristina Fernández de Kirchner unveiled a 10-story-high tribute to Evita Perón last month, dedicating the forged-steel portrait on the side of a government building to the memory of a woman she has often invoked in speeches to supporters. “Let the symbol of Evita be a symbol for the unity of all Argentines,” Mrs. Kirchner said at the unveiling of the portrait, which was her idea. Mrs. Kirchner may never achieve the popularity of Mrs. Peron, an actress who married President Juan Perón and became beloved for fighting for social justice before dying of cancer in 1952. But she is fighting to be mentioned in the same breath one day and may have more of a chance now that she appears to be heading toward re-election in October, aided by a splintered opposition and a growing economy that is overshadowing previous concerns about her polarizing leadership style. The first real test of Mrs. Kirchner’s chances — and of analysts’ predictions that she will win handily — will come Sunday, when the country holds a national primary. Voting is mandatory, and people are allowed to cast their ballots for members of any party, so the results should provide a good indicator of whether Mrs. Kirchner could win Oct. 23 and avoid a runoff. According to several recent polls, Mrs. Kirchner, 58, is expected to get enough votes to secure a second four-year term without going to a runoff. Her nearest competitor in the polls is Ricardo Alfonsín, a congressman from the Radical Civic Union Party, who appears to be trailing badly. “The lack of a strong opposition candidate has created the feeling that she is invincible,” said Graciela Romer, a political analyst in Buenos Aires. The change in perception represents a stunning turnaround for Mrs. Kirchner, who just two years ago seemed a long shot to be re-elected, in part because she clashed with one of the country’s most powerful interests: farmers. But after her husband, former President Néstor Kirchner, died in October, Mrs. Kirchner rode a wave of sympathy and has seen her popularity surge to a record high. Still, recent losses by candidates from her center-left wing of the Peronist Party in municipal elections in Buenos Aires and Santa Fe — and an inability to field a candidate in an election for governor last Sunday in Cordoba — have shown that anti-Kirchner sentiment remains strong in some quarters, particularly among rural voters. The mayor of Buenos Aires, Mauricio Macri, won re-election last month with 64 percent of the vote, easily defeating Mrs. Kirchner’s candidate, Daniel Filmus. 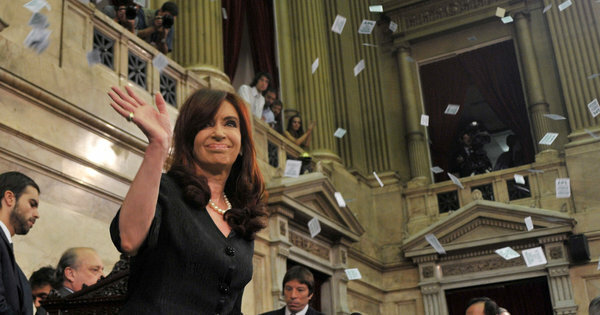 Federico MacDougall, an economist and political analyst at the University of Belgrano in Buenos Aires, said that while Mrs. Kirchner was currently “cruising” toward victory, relying so heavily on La Cámpora could backfire if it drives away more conservative Peronists. In the end, most analysts believe that neither the loss of some party support nor the losses suffered by Mrs. Kirchner’s candidates in local elections will significantly affect her chances. “These are local elections defined mostly by local dynamics,” said Daniel Kerner, an analyst with Eurasia Group, a political risk consulting firm. Mrs. Kirchner effectively continued the economic policies set by her husband, including keeping a relatively cheap peso to make exports more competitive and retaining heavy subsidies on food and fuel to encourage consumer spending. Opposition candidates, including Mr. Alfonsín, the son of former President Raúl Alfonsín, and former President Eduardo Duhalde, have so far failed to persuade Argentines they could offer a more successful economic strategy. Hi B, thanks for your email. This is the kind of article that goes to prove that you shouldn’t believe everything you read and do your own research. Argentina may as well be the best country to relocate to if you can overlook three itty bitty details which are: rampant crime, inflation and corruption. If you don’t have a problem with those three, then Argentina may be the place to relocate to. The first thing you should get used to is nauseating corrupting. We’re usually around the top of the most corruption countries in the planet. Argentina is more corrupt than Tonga, Liberia, Egypt or Mexico. What I find fascinating is that the media repeat all this nonsense as if it were unquestionable gospel. Its been almost a decade since the current president’s husband took over the INDEC, our index and statistic administration. You’re talking about private firms coming up with two or three times the inflation the government officially claims. What good is any of the claims the government makes if it’s been cooking the books with real inflation being 200% to 300% more than the official one on monthly basis? Or a country where two out of three (66%) workers are unregistered/informal workers (according to both the gov. and private sector), meaning that they are not even listed as workers, as tax payers nor will they have retirement pensions, what kind of economic boom are we talking about? “Have you done any sort of activity that could be considered “work”, for at least 2Hs in the last 7 days?” That’s the way they come up with the 9% unemployment rate they are bragging about. The economy booming? Really? Reporters don’t check their sources, they just go with something that sounds nice and pretty to publish an article that goes along with the liberal feel-good attitude their employer is pushing. One tactic that has been used historically in Argentina by whatever tin-pot excuse of a president we have at the time is the idea that they are unbeatable, all powerful and that their reelection is simply unavoidable. No one has been more brutal about this than Mr. and Ms. K.
They created the INADI, something of an antidiscrimination government branch that found a new meaning to the word: If you talk against the government, then that’s discrimination. To increase their control of the media, the Ks came up with the swiftly approved K media law that basically gives them control over printed press, radio and TV including cable. They already have most journalists and reports in their pocket, and nearly every channel needs advertising from the “Presidency of the Nation” to survive. The last standing stronghold would be conservative media group Clarin. Ms. Noble, the owner of this group has been constantly under attack, even on a personal level. Her adopted kids now adults have been DNA tested against their will, the government claiming they where missing children during the last dictatorship. Even if the DNA proved that not to be true, the harassment still continues. But there’s light at the end of the tunnel. The illusion that she cannot be beaten in the next elections is slowly disappearing like recent elections have shown. In fact, Ms. K’s candidate lost the capital city of Buenos Aires to conservative Mauricio Macri who got over 60% of the votes. Today the “primary” elections take place. This is basically shameful manipulation so that the same of politicians get rid of the smaller candidates along with the chance of them gaining any power. We shall see what happens soon enough. Like we’ve seen in the article about Cafayate there’s people selling land and financial “investments” in Argentina as an attractive opportunity during these complicated times. In the old days the conquerors got land and gold from the natives in exchange for mirrors and glass beads. Today, the modern day equivalent is taking place when someone offers (and sells!) an American a house in freaking Salta for nearly a quarter or in some cases half a million US dollars. Because of the world-wide economic crisis people want to believe there’s something safe from its influence, something untouched. In the mind of people they associate distance to safety. This isn’t exclusive to land and real estate, it happens also in the financial and business world where its being promoted that 3rd world countries (these days the politically correct term is “developing nations”) are “shielded” form the crisis. That’s the term the president of Argentina (she who shall not be mentioned) has been using lately, and it’s the same strategy used by other 3rd world leaders and entrepreneurs to attract capital. This though, is far from the truth. 1)Argentina depends on imports from China (and Brazil in a smaller degree). Anything that affects China will affect us directly. 2)Argentina exports to China and Europe. If those countries have problems, exports go down and we suffer those consequences. China already stopped importing (45% of Argentina’s soy export) soy oil from Argentina two months ago. This may be in reply to the importation bans Argentina has been applying this year for plastic products, or maybe they are speculating that the national peso or US dollar will go down. 3) Argentina Depends on financing from the Spain, USA, Brazil and France. Spain, representing 37% of our foreign investments is already going through a severe crisis which affects us too. If USA has financial problems we suffer them as well. Give or take one investor or another, the same holds true for most Latin American countries. The fantasy that Argentina and other 3rd world countries are protected from what’s going on in this globalized world couldn’t be further from the truth. During “Black Monday” NASDAQ went down 6.9% and the Dow Jones dropped 5.5%. At the same time the stock market in Buenos Aires went down 10.73 %(!). The only reason why people in the financial district didn’t start jumping from their office’s windows is that the stock market of Buenos Aires isn’t as significant, we’re an agricultural country. It can go down 15%, it doesn’t affect us as much as it would happen in a first world country with more important financial activity. That’s the positive side in terms of economic sturdiness you have in certain way thanks to the 2001 collapse. The distance may help in terms of physical problems (war, contamination) but the financial world is completely globalized. While a post financial country is smaller and more elemental, its in no way spared from what goes on in the rest of the world, even if it happens to be a great sales pitch to attract foreign investors. Hi! A reader just asked me what to do to prepare for a worst case situaiton in the next 48hs, what would you do this Monday if you knew that the roof wont rise in August 2nd? An interesting article could be, what would you do if you knew USA will default next week? In any event a possible default of a Government, generally does not mean instant disaster. In recent years Turkey and Argentina declared default on their debt and the consequences for the population were very bad but not immediate. The case of the USA is slightly different since it will imply the lack of salaries payment to public sector employees. Certain essential services like health, police, air controllers, firemen and the like, would have practical consequences and a striking effect on the population´s perception of safety and coverage. The medium term effects in the economy could be dramatic since the cost of financing (debt) would increase. All prices will go upwards. The subsequent deterioration of the economic situation would be inevitable. I would like to elaborate on this aspect in future comments. Al in all and although this is not the first time that financial collapse is alarmingly near in the USA, the psychological aspects and impact, are worrisome for the American public. In order to answer your question, if a financial major problem is near, try to keep as much cash as you might get…. just in case. If you have health problems, build up an inventory of medicines you need and keep back up of essential goods for every day consumption. Electricity generation is crucial. In February 2010, the hearthquaqk in Chile left hundreds of thousands of people “incomunicados” when their cell phones run out of batteries. Of course there was no electricity for days in certain areas. In countries like Argentina gas and energy shortages could be a consequence of disrupted distribution services. A new world order is in preparation hopefully it will not be done by organizations like the Bildelberg Conference Group. me, my family and especially my children. never would have thought of necessary 5 to 10 years ago. home rather than have an irrational fear of the subject as a whole. sane or logical answer to in my search for a plausible answer. I say I’m looking for something for myself. Hi LMA, thanks for your email and I’m glad you found my book useful. Sounds like you’re more aware now and getting prepared, congratulations! The kind of people you may come across in gunstores is diverse. Some will advise you well, some will suggest a gun like you said, based on color as if you were buying a purse or accessory, and some will make awful recommendations thinking women can’t handle a “real” caliber. Sometimes they recommend the type of gun they have the hardest time selling. You will rarely get good advice in gunstores, so don’t let them influence you in spite of your own judgment or research. The type of gun I would recommend depends exclusively of how much time you will put into learning how to shoot it and how much practice you think you’ll be getting. If you want something that is easy to carry and handle, that will provide good protection in spite of just visiting the range once or twice a year at most, then my recommendation is a 2” snub nose revolver. Such a firearm may not be the most rugged or mechanical simple when it comes to mechanism and repair, but the user interface is indeed the most simple. The snub nose revolver with its 2 or 3 inch barrel means easier weapon retention when struggling with an attacker, no empty chambers to forget about or safeties, no failure to fire drills to practice, and a very instinctive point and shoot method of use that will come in naturally when reacting during an attack. This will serve a person with minimum training during a last ditch defensive situation, at very close range. Of course with a six round capacity and slow reloading your capabilities are more limited, yet adequate for most of the possible defensive encounters you are likely to come up against. Having said that, in my experience women (and men) shoot better and enjoy shooting Glocks the most when compared to revolvers, even if they are first time shooters. Either the Glock 17 or slightly smaller Glock 19 will serve you well. Both are 9mm so ammo is pretty affordable. While the auto pistol requires a bit more training so as to be proficient with it, it does offer more in terms of firepower and accuracy. When in the shooting range I’ve seen that both women and men shoot faster and more accurately with a Glock than with a short barrel revolver. The Glock has more distance between sights, and the trigger pull is shorter than longer double action pulls. Having 16 or 18 rounds vs 6 also means you can defend yourself from more people. With a 6-shot revolver two or three attackers will be the general limit. If you take into account that hardly 20% of the shots fired will hit your mark according to police statistics, that means chances are only two of your shots will impact your attacker. This is why I would consider the revolver more appropriate for last resort, close to contact range defense against one or two at most. This is of course light years ahead of begin unarmed, but if you can commit the time to go to the range at least once a month and take a Defensive Pistol shooting class, the Glock is indeed a more capable weapon. The important part is being honest with yourself about how much you will practice and if you will take the class so as to learn how to use it properly or not. As for calibers, please don’t use a 22LR for defense. While all rounds can kill, not all of them will stop an attacker. People have been choked to death after shooting their attackers several times with a 22LR, it is indeed the weakest caliber you can shoot, and honestly unless you have some serious physical impediment any adult is perfectly capable of handling more efficient calibers like the ones I mention. With a 357 magnum or 38 special+P revolver, you have an acceptable level of stopping power when you buy ammunition for such purpose, same thing with 9mm. Remember that a revolver that shoots 357 magnum will shoot the slightly shorter 38 special and 38 special +P. The 38 special cannot shoot 357 magnum, so you may want to buy a 357 magnum so as to practice with 38 special and keep 357magnum or 38 special +p for defense. The blast of the 357 magnum is a bit more than that of the 38 special so still shoot a few rounds of the more powerful caliber so as to know what to expect. 9mm will have less muzzle blast than a two inch revolver and may be easier to handle if you’re recoil shy. For Glocks, stick to 3rd generation models for now. 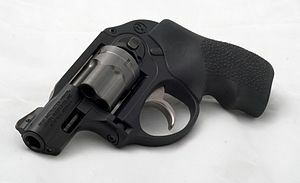 As for revolvers, I like Smith & Wessons revolvers such as the Night Guard or M&P and Ruger makes a nice revolver called Ruger LCR-LG that can be bought with an integrated laser sight. Just put the red dot on the attacker’s chest and pull the trigger. If you visit the Modern Survivalist Forum you probably know of my plans to move to UK. The US Visa is just impossible to get for someone self-employed, I’ve tried for years literally and will keep on looking for a way, but in the meantime I want to be in a better place than Argentina, so I’m thinking Northern Ireland. I was talking with my mother last week about this and she kept mentioning the conflict over there between Catholics and Protestants. It seems that while it is still an issue its not nearly as bad as it was during “The Troubles” and such animosity is currently limited to certain neighborhoods. Heck, for someone coming from Argentina event those are surprisingly nice and clean, and their crime is nothing compared to what I’m used to here. She went on mentioning that England would be better, close to London. I remember telling her that while no place is 100% safe, if I had to play the odds I’d bet on Northern Ireland instead. These are folks that still remember what bad times are like and want to get over it and the smaller population means less trouble while still offering the advantages of a big city. Meanwhile London is a mix of different immigrants with considerable social tension among the various ethnic and religious factions. Combined with an entitlement mentality plus a lack of nerve to handle social unrest as you’re supposed to, where even the use of less than lethal ammo and water guns(!) is forbidden, you can expect to see considerable trouble there eventually. As our kids grow they would see themselves surrounded by all this, and even if you live in the suburbs of London or even a smaller town some distance away, the influence is still there. Belfast with its 300.000 population and its smaller metropolitan area seems more fitting for what we want. Affordable homes, good education and what’s like a dream for us, going for a walk or riding a bike without worrying of our surroundings, that’s all appealing to us. By pure coincidence just a week later rioting started in London and it is still ongoing. Remember guys, we’ve talked about this numerous times: No city has enough police force to control this sort of thing when it starts and becomes wide spread, and it’s pathetic to see unarmed cops trying to stop looters, arsonists and other criminals with what? Offensive language? This quote from CNN illustrates how clueless people are regarding how to deal with this sort of problem. Rioting and mobs have been discussed here before several times. They are not that much of a problem for the aware person if you know how to handle and mostly avoid them, again , something I’ve written about before, but these events are an indication of social degradation, increasing crime and loss of life quality. Eventually when these incidents occur on a smaller scale but almost on daily basis like we see in 3rd world countries, then that’s exactly what your country has turned into. What first caught my attention was the watch’s good looks. Even if its purpose oriented designed, the concept of “function follows form” turns out well in this watch with its clear lines only finding the slightest bit of tension by the asimetric position of the crown and bezel guard extending in the lower right corner. The crown is positioned there so it doesn’t dig into your wrist. All this gives the watch its character which combined with reliability and an affordable price (compared to other divers watch) earned it a bit of a cult following. The Seiko Black Monster has a tough self-winding mechanism, robust stainless steel case and bracelet, unidirectional rotating bezel and a screw-down crown for setting the time and calendar. The crystal is curved “Hardlex”, which is proprietary material of Citizen. Its better than mineral crystal but not as scratch resistant as sapphire. Does it mean that sapphire is better then? I don’t think so. Sapphire may not scratch but will shatter on impacts that may just scratch Hardlex, but otherwise leave the watch functional, so it’s a good call for a tough use watch that may be impacted by tools, diving equipment, rocks, etc. Seiko’s patented lume material, Lumibrite, is the brightest found on any watch. It’s impressive when you expose it to a light source and turn off the lights. Only tritium vials would do a better job, and then again only in the long run when the lume in the Black Monster wears out and needs light once again. This fortunately takes long enough so its not a problem overnight. While some watches have navigation tools or more intense LED that could be used for illumination, I’m not sure about watches being “survival” equipment. Maybe a digital compass can be a life saver or the intense LED in some watches be used for some emergencies, but I believe it would fall into the “makes life easier” category instead. That’s still good enough reason to get a Suunto Core or Casio Pathfinder if you’re inclined to do so. What the Seiko Black Monster offers that appeals to me is excellent built, ruggedness and the lack of need of batteries to keep on working. Some people may also like the fact that it would not be affected by EMP because it has no electric components. In a very unlikely scenario where batteries are no longer available, all you would need would be some maintenance every couple decades or so. Why even carry a watch then if I already have one in my cell phone? Obviously keeping track of time would be number one. Depending on your line of work and lifestyle you may be checking the time of the day on your cellphone several dozen times a day. When you have meetings, kids to pick up from school, planes to catch, last minute deadlines, the plotter guy closing at exactly 5PM and you wondering if its worth making a run for it or not, just checking your wrist is easier than going for your cell. One other thing to keep in mind, especially if you work in big cities where opportunist burglars may abound, is that getting your cellphone out increases the chances of it getting snatched from you. In Buenos Aires you notice that the more cautious people or the ones that got tired of getting their cell phones robbed, they move aside into a store or building entrance to talk while away from the sidewalk where the pedestrian transit makes for a quick grab n’ run. Getting a nice cellphone stolen doesn’t come in cheap, better use a watch for keeping the time of the day. The Seiko Monster is offered in several colors, but the most popular ones are the ones that I have, the Black and Orange Monster. The only difference is the color of the face of the dial, but for some reason that change alone makes the look and feel like completely different watches. The Black Monster is more formal and classic. It wouldn’t be out of place while wearing a suit. The Orange Monster looks very good but its clearly less formal, more appropriate for casual wear, especially during summer. I suppose the Black Monster is the more versatile of the two. Something different from my regular posts folks. If you’re an analog type of guy you’ll love this watch, and this is one of the toughest ones out there.